A vibrant plea in favor of a better world, this book introduces us to a universe rich in traditions and spirituality. For over a year, Guylaine Cliche mingled with people of the Mohawk Traditional Council of Kahnawake with the aim of conveying their message. True to the structure of the speaking circle, this book brings together 15 individuals from nine different origins to share their personal stories as well as teachings from the oral tradition. Among these teachings, the Moon Teaching is paramount. It reveals the importance of the woman, who is the source of the Creation, in our modern society. Forming a matrilineal nation, the Mohawks proclaim the urgency of restoring the power to women. The Mohawk message of peace also invites us to reconnect with our roots and to take concrete actions to honor and respect our Mother Earth before it’s too late. The Kanienkeha’ka (People of the Flint) are the founders and the foundation of the Five Nations of the Iroquois Confederacy and the Great Law of Peace. 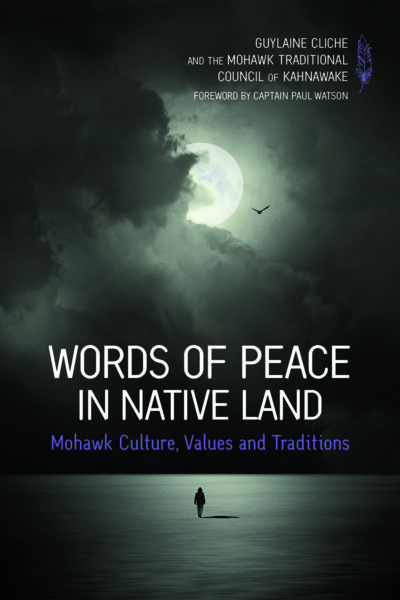 The people of the Mohawk Traditional Council of Kahnawake, represented in this book by Stuart Myiow Junior from the Wolf Clan, live in what is called the Up-the-Hill Longhouse.